Given the fact over 75% of all international ventures fail due to cross cultural issues, I’ve Made It strives to ensure organizations succeed globally with a sharper focus on developing intercultural competency and communication. In this hyper-connected world the need of the hour is building understanding between peoples, religions and ways of life. The mandate for leaders is to leverage cultural differences and proactively see uniqueness in different cultures. move into a regional or global role? sharpen people and leadership management skills? navigate through a complex and ambiguous business landscape? Cultural knowledge can be learned via training but to achieve cultural competence requires practice. Challenges due to cultural differences can manifest in different ways and having a Coach is a great way to practice as well as hone potential in a diverse environment. Coaching from a Cultural Perspective helps the executive develop new alternative ways of thinking, communicating, managing time, and engaging with international colleagues and business partners with clarity and sensitivity. Anita worked in several countries and has systematically and organically learned to navigate ambiguity and differences. As a Coach her focused specialized is Coaching from a Cultural Perspective. Between her life and coaching experience Anita has developed deep questioning skills and perfected the art of observation, reflection and silence; she believes in fostering mutual respect and confidentiality and takes time to explore how far the client feels safe to travel outside their cultural comfort zone. I’ve Made It sessions help reshape attitudes regarding cultural differences in order to better navigate ethnocentric pitfalls and cultivate curiosity about alternative worldviews. I’ve Made It coaches accomplish this via a structured workout regimen which includes face-to-face meetings, regular coaching calls, video conferences, and email support. 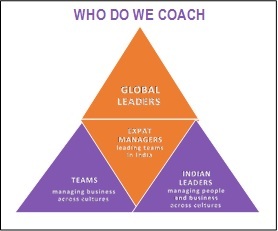 I’ve Made It - Creating resonance and facilitating growth for global leaders, expats in India, managers and teams with global roles. My experience with you was thought provoking and enriching session. Since this is my first international work experience, it was a great opportunity to be able to speak with someone who had much knowledge and experience living and working in different countries and experiencing various cultures. The concept of ‘stretch and assimilation’ when it comes to settling into a new culture was very helpful for me and I have made a conscious effort to make it so. Also, the reading material provided also was very useful to consolidate knowledge into simple repeatable models to be practiced. Additionally, the social gatherings and local hotspots suggested to visit were also great opportunities to soak up the ‘real Indian culture’.